Four million holes are dug every year in the UK. Five billion pounds are lost through the economic effects of disruption and traffic hold ups, while hitting a utility pipe or cable can prove fatal for those working on the road. Adam Hart- Davis reports about Mapping the Underworld on Radio 4 a major research project which is trying to solve the problems. He takes us underground from his ancient ice house at the bottom of his Devon garden to report on Mapping the Underworld, the £3.5m programme involving universities throughout Britain. The aim is to improve how we locate the increasingly confusing and complex array of pipes, cables and sewers beneath our streets, and assess their condition – as well as ultimately providing a better map of what is beneath our cities to improve planning both above and below ground. At the moment it’s often difficult to know where such utilities are – an estimated one in four of all holes are dug in the wrong place. Maps may not be accurate because original records of where the pipes and cables are located often use reference points on the surface which have long since gone. 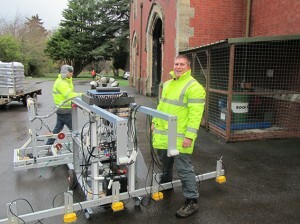 Adam Hart-Davis tries out the prototype of a multi-sensor cart where four different sensors operate together to produce an all-in-one solution, so if one technology doesn’t work well in certain conditions and with particular materials, another one will. It is not an easy undertaking for the research teams or, as it turns out, for Adam testing and playing the multi-sensor cart. Mapping the Underworld is the subject of a Radio 4 programme titled Mapping Britain’s Underworld – Friday May 25, 11am. The Mapping the Underworld research team hosted Adam Hart-Davis for a recent test day to demonstrate MTU technologies and cart development. The day forms part of a programme dedicated to the research being conducted by the MTU team. The programme will be aired on Friday, 25 May 2012 at 11.00am on BBC Radio 4 and will be available for one week after the broadcast via the BBC iPlayer (its listen on demand facility – http://www.bbc.co.uk). 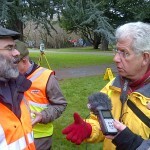 In March 2011 the Mapping the Underworld team hosted an awareness raising workshop to scope how the dissemination of the research carried out by the Mapping the Underworld programme could be further extended to not only the practitioners responsible for locating and implementing the repair and replacement of underground assets but also MPs, highway and traffic management officers and councillors involved in local government to represent the views of their councils, residents and businesses. Click here to listen to a podcast interview with Dr Nicole Metje, who led this initiative. The lack of a common source of accurate data was a frustration expressed several times, as was the perception that poor communication and information sharing remained a problem; although this is beginning to be addressed. Across the country different approaches are taken by local authorities. 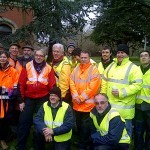 Kent County Council and some London authorities use a permit scheme to coordinate streetworks. Such a scheme currently requires Department for Transport permission. The indirect costs of streetworks disruption, particularly when problems arise as a result of inaccurate location need to be taken into account. Repeated, uncoordinated works were a particular frustration for council officer and councillors. The owners of the assets need to be involved alongside the contractors, professional networks and local authorities in finding the right solutions to the problems. Communication is essential between all parties with an interest along with an understanding of the impact that excessive excavations can have on the industry, other businesses, commuters and local authorities when underground assets cannot be accurately located. Coordination and collaboration can be inconsistent and needs to be improved. Both the direct and the indirect costs of excavations are of importance when considering the impact of streetworks on the UK economy and the benefits of any potential solutions. There are significant issues, challenges and costs arise as the result of different and variable approaches to the location and excavation of buried assets. The inability to gather and share data and other information is a major concern. Information should be easily and readily available to residents and local businesses on the extent of the works planned. There were differing views on whether further regulation is required. that poor communication and information sharing remained a problem; although this is beginning to be addressed. in finding the right solutions to the problems. Three landmark events will deliver the latest knowledge in both indoor presentations and outdoor demonstrations, of the latest utility location and protection systems, coupled with the imminent developments in utility professional training, qualifications and safety. Over £1.5 billion is spent annually on streetworks, and over 4 million holes are dug each year in and around our carriageways. It has been estimated that the social costs of such work in terms of disruption and delays adds a further £5.5 billion. Mapping the underworld is a major research programme aimed at developing a robust suite of techniques for identifying the range of services that underlie our streets. More accurate identification of this, often complex, network of pipes and cables has the potential to significantly reduce costs, delays and accidents. In this note, Mark Hamilton of Birmingham University and , Project Manager for Mapping the Underworld, provides a summary of an event involving some of the programme participants. This year’s Mapping the Underworld (MTU) annual event was held at the Ordinance Survey, Southampton on the 8th of September and was supported by the Pipeline Industries Guild (PIG) and UK Water Industries Research (UKWIR). The event attracted a hundred delegates including representatives from utility companies, those involved in delivering utility detection services, regulators, academia; indeed, anyone with an interest in locating buried infrastructure. Sitting alongside speaker presentations were select exhibits from companies such as OXEMS and JK Guest, who used the event to launch new to market products and services. One highlight of the event was the presentation from Jon Guest of JK Guest who has been working closely with the MTU team, in particular Dr Alexander Royal and Dr Nicole Metje, to develop an accredited national testing arena for industry personnel. It is hoped that with continued pressure from industry members and Government lobbying new rules, strict monitoring and an accreditation system will be developed and introduced in the foreseeable future. Nicole, who is the UK member of the CI/ASCE 38-02 Committee (the American standard), has also been working with James Lewis of Cardno TBE towards the establishment of a UK standard. Their presentation scoped the path forward and the subsequent question and answer session reinforced the need for this work to continue. The benefits would include better regulated surveys by qualified and accredited surveyors employing safer working practices and, in the end, reduced excavation requirements. Kevin Gooding of OXEMS described in greater detail their underground asset management solution. The OXEMS integrated solution, which identifies both PE and ferrous assets, is now available (initially for water utilities). It is a designed-for-purpose, integrated combination of: indestructible passive tags priced for network-wide use that are fixed directly to underground assets; robust, easy-to-use, state-of-the-science detectors for use in the field; and a comprehensive database that automatically updates with any intervention. Another highlight was two presentations by Jo Parker of UK Water Industries Research (UKWIR) and Watershed Associates. UKWIR provides a framework for the procurement of research for the UK water industry and have been supporters of the MTU project since its inception. Together with the Pipeline Industries Guild, they were joint sponsors of this event. In her first presentation Jo reinforced the message that a UK standard is important to the future of the industry, but equally that this is not the first time such a standard has been attempted and its success is by no means ensured. In her second presentation Jo demonstrated the impact of Scottish trial of the VISTA project, which uses utility records and complementary techniques to build a GIS map of the below-ground infrastructure. The trial has been so successful that a full Scottish roll out is now underway. See www.ukwir.org and www.watershedassociates.co.uk. Professor Kai Bongs presented on Gravity Gradient technology being developed at the University of Birmingham and how cold atoms and quantum physics can help to find underground voids and thus utility assets. This is a project in its infancy but if successful and integrated with other technologies, such as the four sensors developed by the MTU project, then this could have a significant impact upon how pipes and voids are located in the future. Further presentations were given by the University of Birmingham on complementary research. This included the DART project – Detection of Archaeological Residues using remote sensing Techniques. The focus of this research is to find the best ways to employ different sensors (a multi-sensor approach) for the greatest heritage return (deploying techniques in a way that goes beyond replication and identifies complementary approaches). In particular, how do we improve the use of different sensors in regional/national prospection programmes and what are the best conditions (e.g. environmental, seasonal, weather, crop) for deployment? The University is also researching how to make buried water pipes smarter through the use of nano-sensors integrated into the pipes themselves. Concluding remarks were delivered by Chris Rogers. The day had demonstrated that there is a clear desire from the MTU team, but also from industry, for the MTU project to succeed. It sits within a suite of complementary initiatives the benefits of which, to industry and the environment, are extraordinary. With time we hope to see these cutting edge technologies delivering further tangible results in the murky underworld of surveying and asset location. 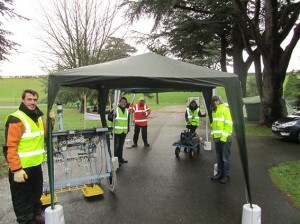 The Autumn 2009 Newsletter, which provides an update about ongoing research and site trials, along with a brief summary of the Project Launch, held in February 2009. Our next newsletter will be published shortly, and will contain a detailed overview of the MTU-ORFEUS joint event, which was held at the Ordnance Survey in Southampton earlier this year. This video illustrates a wheel attached with a gray-coded panel. The video images, captured at a known frame-per-second rate, are thresholded to produce binary data, and then decoded to calculate the speed and movement of the wheel.